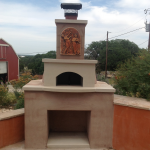 Texas Oven Co. Cook for Three Days - Texas Oven Co.
Like Michael Pollan, I had some goals in mind in this project. He and I both are serious about the “efficient use of precious firewood” (NYT magazine). 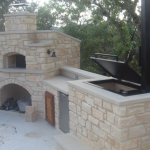 In an efficient oven, the energy created by a single fire can cook food for a week’s worth of family meals. 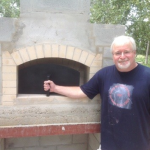 Mr. Pollan’s second goal was to use the fire in the cob oven to “roast, braise, bake, simmer and grill as many different dishes as possible—for lunch, dinner, breakfast and lunch again.” My second goal was to showcase the variety of everyday foods you can cook in a wood-burning oven and demonstrate how to take advantage of slowly descending temperatures to cook for three days. 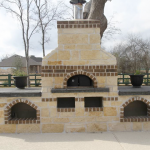 Since a Texas Oven is custom built for energy efficiency, I was able to extend the heat from a single fire to cook for three days. 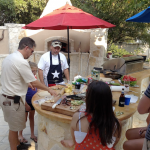 My friends Mimi and Fred and our two girls helped with food preparation. 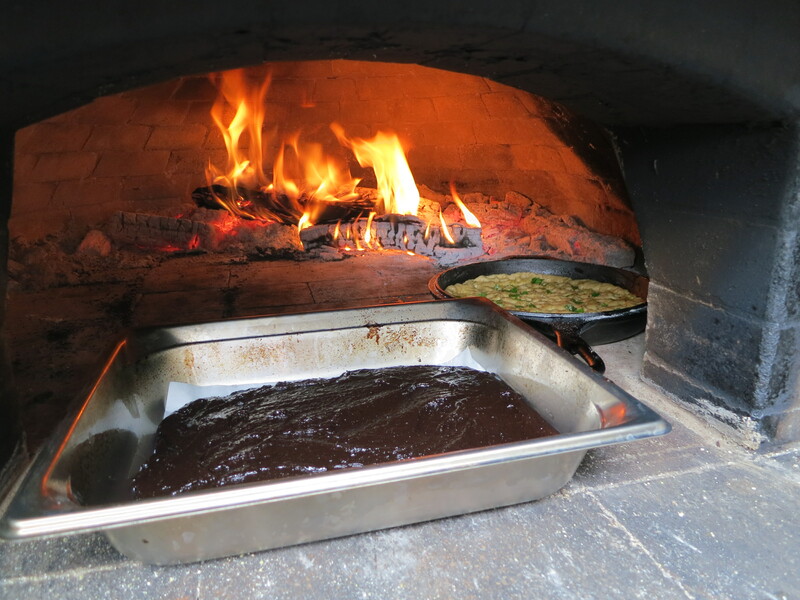 We started off firing up the oven on a Sunday afternoon. 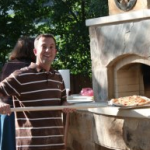 When the guests arrived for our pizza party, the oven was at 1000 degrees—just perfect for pizza. 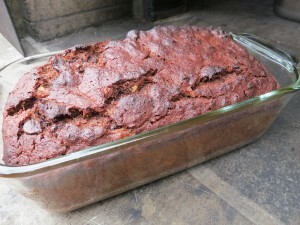 As the oven cooled slightly overnight, we did a lot of baking on Monday, day two: French bread from Peter Reinhart’s recipe, Mimi’s buttermilk dinner rolls, blueberry muffins that our daughter made from a Smitten Kitchen recipe, and chocolate banana bread our youngest daughter made from the same blog. 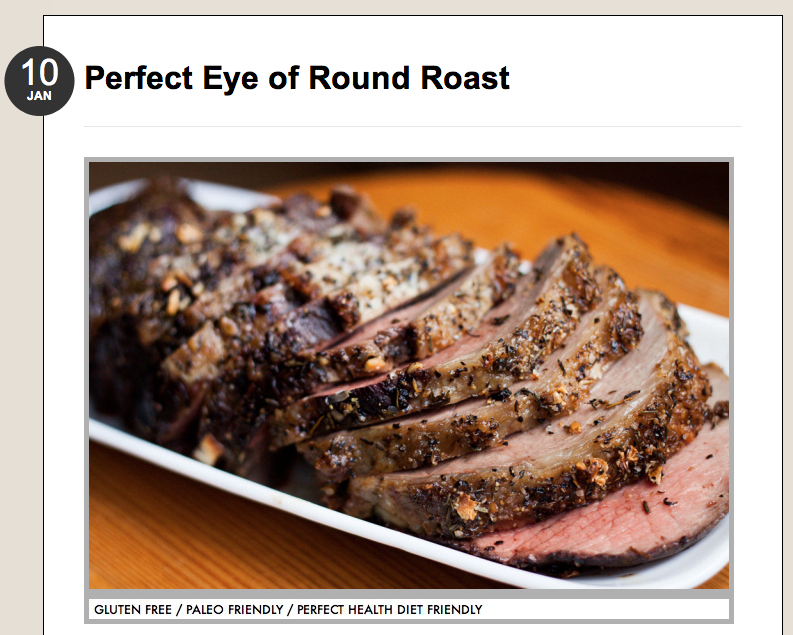 After the baking I put in a beef roast and a chicken. Mimi put in a pan of baked beans, and I added baby potatoes. 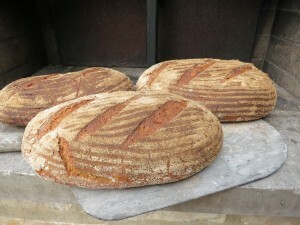 Later that night as the oven had cooled slightly, I put the picked over chicken bones back in with water to make stock and tucked my Dutch oven in with whole-grain oats (groats), water and chopped dried apricots which would become our breakfast next morning. Day three, after I took out the stock pot and breakfast groats, I put in a some dried white beans with part of the stock and fresh sage to make my version of Marlena De Blasi’s Tuscan-style white beans. My third goal was to document with pictures and temperatures what we prepared in three days to give you an idea of how to prepare wonderful food, not only for a party, but to last your family for the rest of the week. Along with fresh salads and summer veggies, the beef, chicken and beans we prepared will appear in various forms this week. 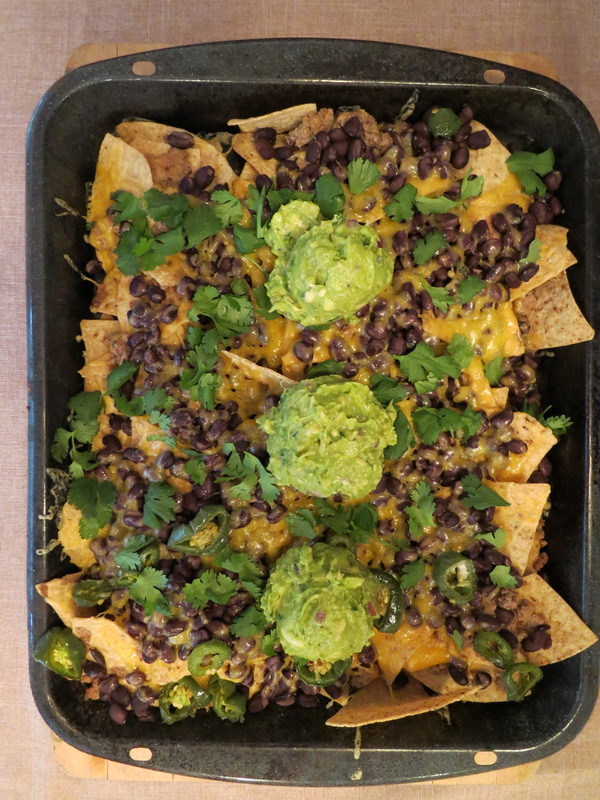 The baked goods and left-over pizza will star in lunchboxes. 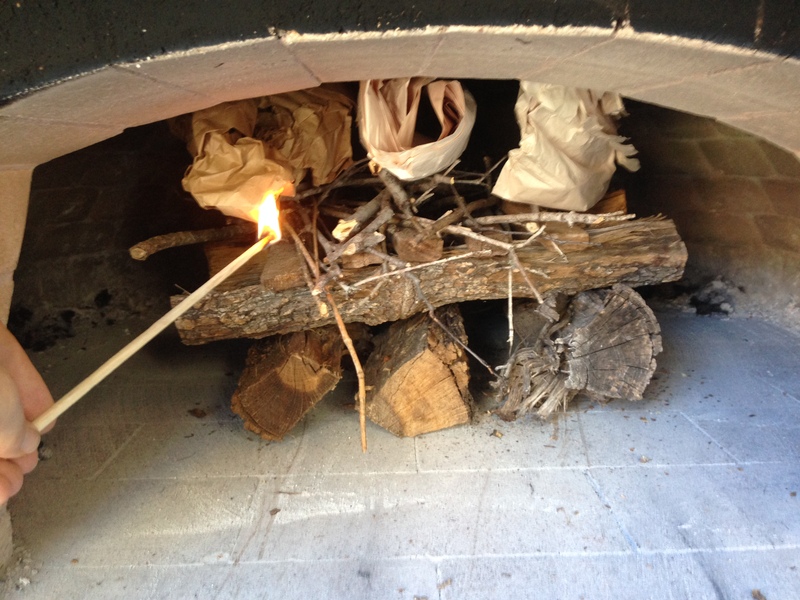 We built a top-down fire and lit it late in the afternoon. We let the fire burn down to coals and then fed it with small pieces of wood to slowly build up the temperature. As the oven heated we roasted mushrooms, jalapeños, onions and other veggies for pizza toppings. 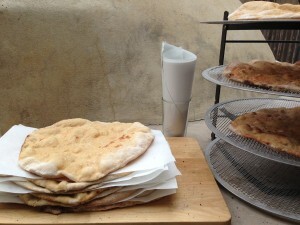 At the same time we pre-baked some pizza dough shells to be ready for our pizza party Sunday night. When the shells were all pre-baked we still had some time before our guests arrived and decided to bake-off Fred’s brownies based on Alton Brown’s recipe. 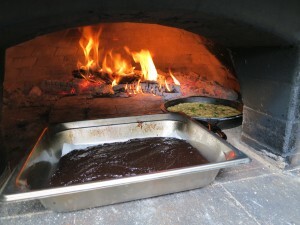 The internal temperatures were over 700, but we could bake the brownies in the 300-350 range near the entrance, rotating the pan occasionally for even baking. 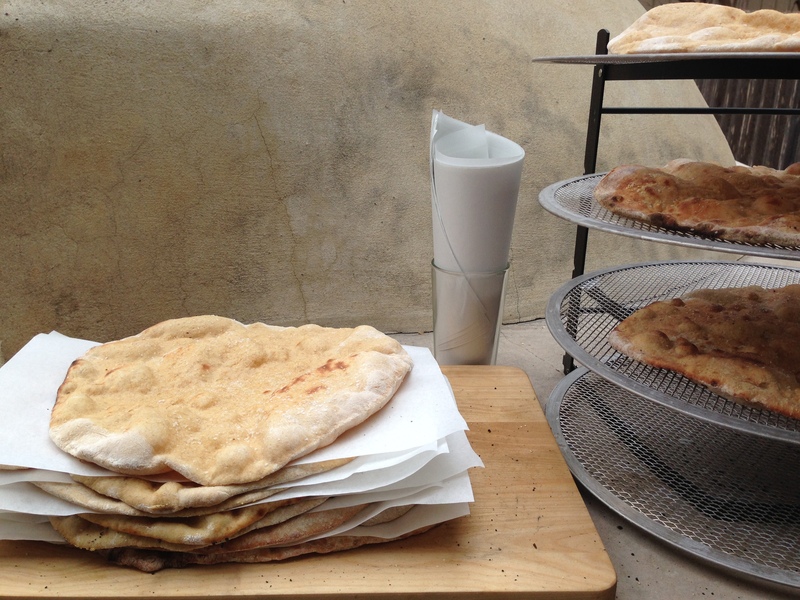 Slightly inside we’re baking focaccia at around 450. 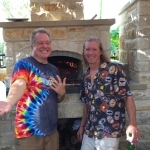 With the shells ready to go, we enjoyed several types of pizza with our friends on Sunday night. Monday morning with the oven temperature 550-600 we baked a few loaves of whole wheat French bread based on Peter Reinhart’s recipe in Artisan Breads Every Day. 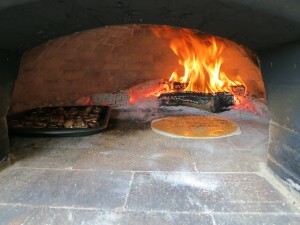 Nothing beats breakfast cooked in a wood-burning oven. 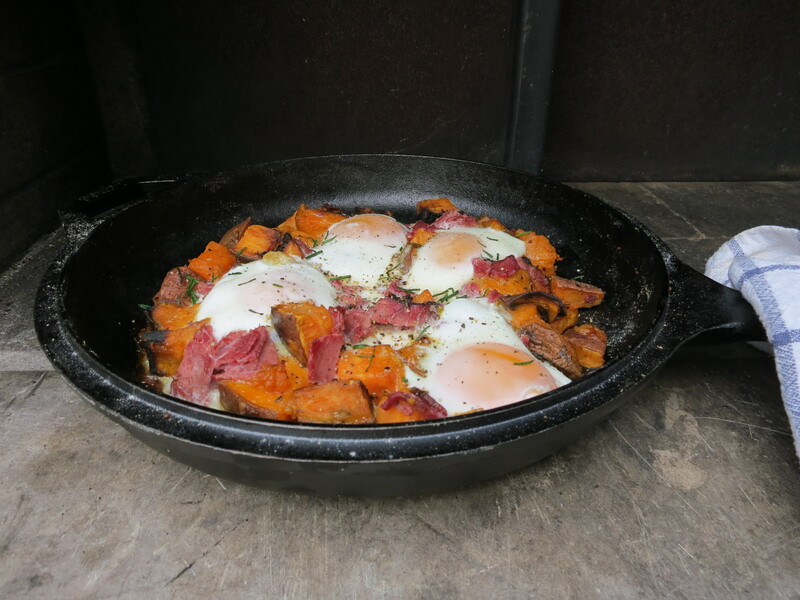 This is sweet-potato hash with soft baked eggs. Throughout the day on Monday, as the oven temperature slowly descended from 550 at 8am down to 400 at 5pm we baked and broiled. 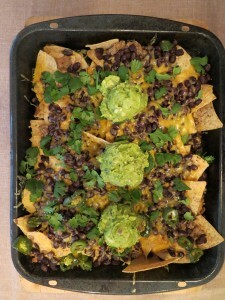 At lunch time some of the leftover roasted jalapeños spiced up a basic pan of black bean nachos. We slid these into the wood-burning oven instead of heating the broiler inside. The girls each baked a recipe from the Smitten Kitchen blog, shortening the cooking times to accommodate the more efficient baking and slightly higher temperatures. 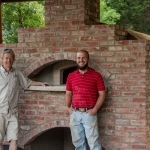 Don’t panic if a recipe calls for 350 degrees and your wood-fired oven is hovering closer to 400, just check for doneness a little bit sooner (a good rule of thumb even when the oven temperature matches your recipe). 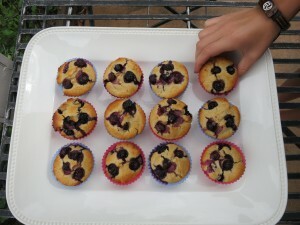 These blueberry muffins didn’t last long. 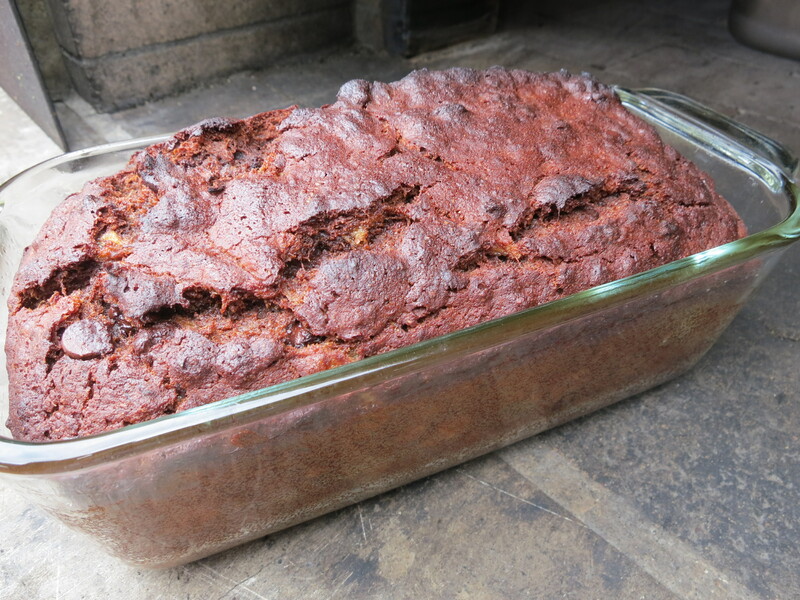 The moist baking environment of the wood-burning oven worked beautifully for this rich double chocolate banana bread which usually bakes at 350 but went in when the oven temp read about 400. 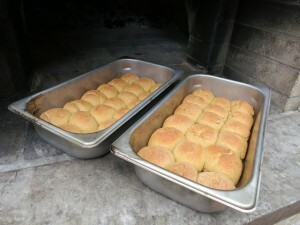 Mimi made her buttermilk dinner rolls bite-sized and updated her favorite recipe to use Kamut. By about 5pm the oven was hovering between 375 and 400 degrees. 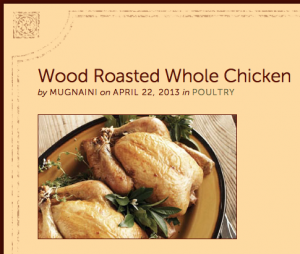 We decided to put in a whole chicken prepared as described here but without a live fire. At the same time we seared an eye of round roast in a Dutch oven and followed the rest of the instructions from the recipe here. 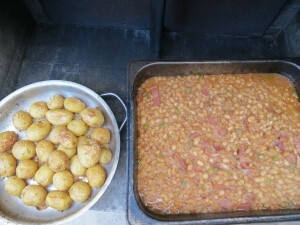 Mimi’s baked beans and these roasted baby potatoes based on a recipe by Giada De Laurentiis went in around the same time. Late on Monday night we put the remains of our roasted chicken back into the oven with some aromatics and water to make stock. At the same time we put oat groats in a Dutch oven with dried apricots and enough water to let them simmer overnight. 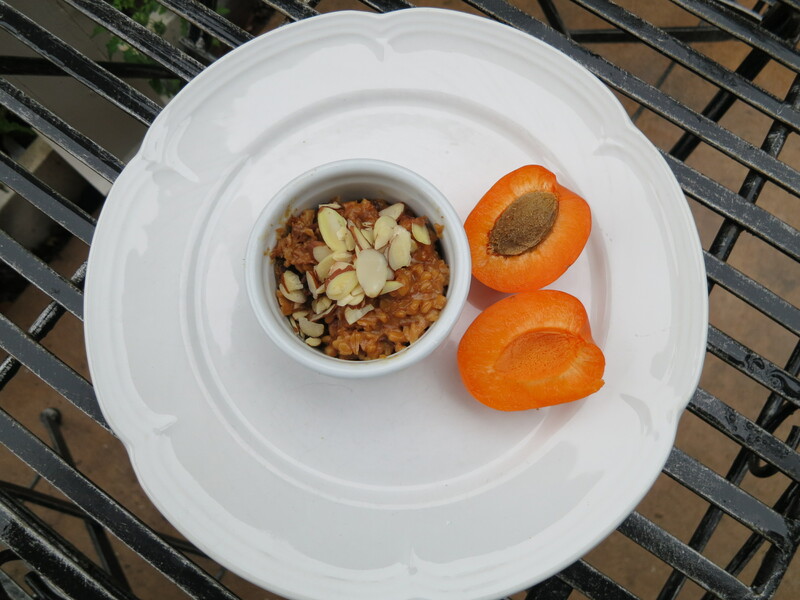 Tuesday morning the apricot oatmeal with almonds was ready for breakfast. Finally, on Tuesday morning I put in a batch of white beans based on one of the recipes that fueled my interest in wood-burning ovens. 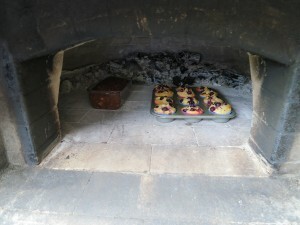 In her book A Thousand Days in Tuscany Marlena de Blasi describes the communal wood-burning oven in the town where she lived. 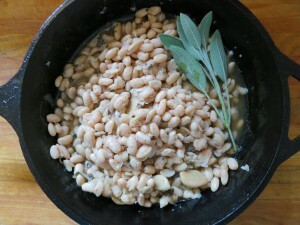 Her description of white beans baked in a wine flask with olive oil, white wine and sage sounded irresistible.